The Golden Eagle is a western bird that is a rare but regular winter visitor to Tennessee. While debated for many years, there is no evidence that there were historic nesting records for this species in the state. Nonetheless, 47 captive-raised eagles were released in Tennessee from 1995 to 2006, and several more were released in North Carolina and north Georgia. In the 1980-90s and early 2000s, a pair that included a bird released in Georgia, did successfully produce a total of six young from a wild nest on Cordell Hull Lake, in Jackson County with nesting that apparently has continued through at least 2012. The normal range of the Golden Eagle is in western North America from Alaska to central Mexico. It is also found in Eurasia and parts of Africa. 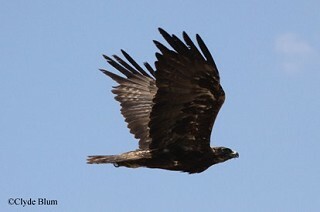 This eagle is most likely to be present in Tennessee from mid-November to early March. Description: The Golden Eagle is second only to the Bald Eagle in size. It has long, broad wings that are held in a slight "V" when soaring, and legs that are feathered to the toes. The adult is dark brown with golden tinged feathers on the back of the head. First-year birds are similar to adults, but have a white base to the tail, and white patches in the wings that are visible in flight. Males and females are alike in plumage, but the female is larger. Young Bald Eagles are overall brown, but have un-feathered legs, all but first-year birds have white feathers scattered across the body and wings, and soar with wings held flat. Bald Eagles tend to flap more often than Golden Eagles. Turkey Vultures have an un-feathered head, hold their wings in a more pronounced "V", and often tilt from side to side while soaring. Habitat: In Tennessee, Golden Eagles are more likely to be found near wooded areas interspersed with patches of open habitat. Diet: Medium-sized mammals such as rabbits, ground squirrels, and prairie dogs, and on rare occasion, domestic animals such as sheep and goats. Nesting and reproduction: The only confirmed nesting of Golden Eagles in Tennessee occurred in 1993, 1994, 1996, 2000, and 2001 on Cordell Hull Lake, Jackson County. One pair, that included a bird that was released in Georgia, successfully fledged a total of 6 young from a wild nest. The origin of the other member of the pair is unknown. Status in Tennessee: Golden Eagles are a rare, but regular migrant and winter resident across the state, and very rare in summer. They usually arrive in mid-November and depart by early March. Based on the previous assumption that Golden Eagles historically nested in Tennessee, they are currently listed as Threatened in the state. The Golden Eagle hacking program, conducted in Tennessee from 1995 to 2006 by private donors and volunteers, released 47 captive-bred young eagles from sites on Chickamauga and Douglas Lakes in order to introduce a breeding population. The fate of these birds is unknown, and this program has now ended because Golden Eagles are not native breeding birds in Tennessee. The oldest known Golden Eagle in the wild was 28 years, 4 months old. Best places to see in Tennessee: While always rare, Golden Eagles are can be seen in any region of the state between mid-November to early March. They are most regularly seen at Reelfoot Lake, and Tennessee NWR. Kochert, M. N., K. Steenhof, C. L. Mcintyre and E. H. Craig. 2002. Golden Eagle (Aquila chrysaetos), The Birds of North America, No. 684 (A. Poole and F. Gill, eds.). The Birds of North America, Inc., Philadelphia, PA.